Giving can be deeply rooted. On the cusp of becoming a third generation college graduate, it was a bit of a shake up when I told my grandmother that I planned to attend Elon University, then called Elon College, in the summer of 1990. After all, since about the time I was born, I had been lectured to, preached at, read to, and even written about my family’s long lineage of Historically Black College and University (HBCU) graduates and because many of them were a part of raising me as a little girl, I heard the stories first hand. At the time Elon was an unknown, and very much outside of the ideology that she had spent so many years raising me to follow. In 1995, I went to visit my grandmother in Chester, South Carolina for a week in late August. During that visit, she told me many family stories and shared years of wisdom. She tried to give me some of her precious antique dishes and even furniture to haul away in my two door rental car, all of which at the young age of 22, I refused. What I did accept from her, however, was her Morris College pin and her graduation pearls, which were the most important pieces of her life story, and likely, the most important pieces of mine as well. My grandmother, the youngest of 10 with 9 brothers, who were all prominent HBCU graduates, brought me and my cousin to my see my uncles within driving distance quite often. We’d stay with them in their homes, and go to the public schools where they taught, visit businesses that they owned, sat on their front porches and eat churned ice cream, listened to them play the piano, violin and harmonica, went to church and heard them preach on Sunday and think that this was the norm, because after all, a college education was a non-negotiable for us. As my cousin and I grew up, and other influences came into play, including our own parents’ openness to different collegiate experiences, our understanding of our family HBCU legacy waned, and our interests were diverted to other schools. It wasn’t until that day, more than a year after my undergraduate commencement from Elon University, that my grandmother reminded me of her deep roots at Morris College. I only wish she had given me her diploma that day, but that she would never give up. Pride in a legacy can be powerful. A little more than two years ago, I arrived at a HBCU for an introductory meeting to learn more about a capital campaign that was afoot, and how our team could help. I was completely in awe of the opportunities that I saw and we quickly got in and got started. It was some of the hardest, and most rewarding work I have ever done. And for the last two years, as a team, we were able to not only help to build a new team there, but we also helped to inspire more giving and learn about a culture of pride that was far deeper than I expected. Deploying a boutique blend of the best fundraising practices that I had learned in both resource abundant and resource sparse environments over the years made our team adaptable, and it also made me better appreciate some of the discipline that I earned to lean into as a fundraiser over the years. The effective use of data, coaching, and accountability systems can be implemented in any fundraising environment. However, how we use these systems to engage alumni, and other constituencies in our HBCU environments is more crucial today, than ever before. The gaps in the legacy and current wealth in most HBCU alumni versus peer predominantly white institutions results in significantly lower endowments and alumni giving ratios. The giving levels of alumni directly correspond with student loan debt, employability, income upon degree completion and other mitigating factors that students often live with, as many are first generation college graduates, even today. An inability to substantiate and articulate these circumstances through the use of institutional data and trends sometimes deters HBCU advancement teams from effectively soliciting the right gift from all constituency groups. While facing each of these realities, we were still charged with advancing an HBCU mission. We continued to move a campaign forward, and that's when I began to understand more about pride. As our engagement deepened, I started to meet more of the older generations of alumni and built meaningful relationships with some of them. People who volunteer, spend nights and long weekends fundraising, and make deep personal and financial sacrifices for their alma mater. That is pride, and it is personal. Engaging Investment from Alumni is a must. My grandmother's college pin and pearls are symbolic of a legacy of both pride and sacrifice. Morris College, is not what it was during the years that my grandmother attended. A woman who was quietly generous to her church and other causes throughout her life was never significantly invested as a donor in her alma mater. Was it just that she was never asked? I will never solve this mystery, but I believe there are many out there that can be, by engaging with those who have pride in their institution's legacy. It's as simple as the gift of the pin and pearls I received without out even asking for them, because I was just there to listen and learn. We're Launching a new three month fundraising masterclass series designed to coach advancement and development teams for success! It's a hands-on fundraising basics class taught with a "Gift" specific toolkit that includes real talk with successful fundraisers, donors and training with our team. All to master Getting The Gift! Sign up for more information by clicking here . A little over 5 years back, I came to Chapel Hill to work for an endeared Catholic Priest named Monsignor John A. Wall. It pretty much changed my life. So much so, that my boss back in New York, at a great fundraising firm that I worked for knew that I belonged here forever. Thanks Chad. And that's how it went. I started a small fundraising firm with some passionate, generous, hard-working folks, spent many miles on the road, ran three campaigns on two campuses that resulted in two new facilities, lots of scholarships and new programs. More good work to come! I had a chance to give a short goodbye message at UNC Horizons Friends and Family Day a couple of weeks ago. We're excited for the future of what will build and grow for Horizons, with a greater village around and a new facility. We are grateful for having been a part of that! The best way to find yourself is to lose yourself in the service of others. - A quote by Ghandi that has rang true throughout all of my life. I learned this best through watching it lived out through that of my grandmother Annie, and my Aunt Ila Faye, and now, my own. Three years ago, when I met Dr. John Thorp and his wife Joe Carol with my then boss, a Catholic priest on a snowy January night, I never thought we'd all be standing here today celebrating this wonderful gift we've been given by a community of supporters and friends that rallied and believed that we were worthy and deserving of more than we'd ever had, and ready to do more than they'd ever done or been asked to do for Horizons. When I got here, I was at a low point in my life, a true crossroads, but working with you, John, Jo Carol, Linda, Kavita, Hendree, David, Mark, Tim, Angela, Kandace, Charla, Gordon, Kevin, Mark, Rachel, Julia, our co-founder Connie and your entire leadership team, our Advisory Board and the University Development Office team to see this through was an incredible journey for us. And, truly for me. I was able to build a small heart-led team of great people that loved this as much as I did with Mary Liz, Felicia, Maria, Michelle and Chris. They did so much behind the scenes that many never knew and will never know. And we had the prayers and love of many to see this through. I am grateful to my daughter Taylor who managed to cope through some tough times without her mom while I did what I believed in because she did too. We thank you for your trust and kindness. I thank you for opening your heart to us. I am grateful to all of the women who had the grace and the gratitude for Horizons to tell their stories to our supporters during such fragile times in their lives. And I wish you Godspeed on this courageous road less traveled before you. I ask that we all become fundraisers and ambassadors for this program. Tell your family and friends about us and invite them for tours and to give at any level with open hearts! I'll leave you with this. On the day I started the job to build my first multi-million dollar capital project many years ago for single mothers and their children called Wilson Commencement Park in Rochester NY, I received a card on my desk from my dear mentor and friend. I knew I was in a place where I had no idea what I was doing. "At the moment of commitment, the universe conspires to assist you.."
May it continue to assist you, our women and our children, with love. Pictured Above: The team from UNC Horizons, Legacy Real Property Group and our donors. Driver. Fairway woods. Hybrids. Irons. Wedges. Putter. Each of the clubs in my golf bag has a specific purpose, a set of shots it is designed for, and they all work together to get my ball to the hole. Leadership gifts. Major gifts. Annual fund. Donor relations. Development communications. Each of these fundraising programs has a specific purpose, and they all must work together to get to the fundraising goal. Drive for show, putt for dough. Every golfer loves to spend time on the driving range whacking balls as far as they can go. It’s exciting to see a pure drive sail off the tee and compete to see who can hit the farthest. But the shortest shots, the ones that you can make consistently, will be most critical to keeping scores low on the course. A huge leadership gift, much like a monster drive, might get the most attention, but a good golfer knows that is just one shot per hole. Good fundraisers know that in most organizations, the majority of gifts come in through the annual fund, even if they aren’t raising the bulk of the total dollars. These gifts are an important part of the fundraising pipeline and a strong fundraising program needs to know how to consistently close on annual gifts just as well as they go after the big shiny major gifts. Know the course. Before I step up to the tee box on any given hole, I’ll check the yardage to determine club selection, and maybe even use a range finder to get a more accurate distance and target to map out my strategy. Then I’ll choose the appropriate club and take my shot. Similarly, if you have a new prospect, you wouldn’t just throw a generic $1,000 proposal at them without doing some research to see if that was within their giving history or capacity. You may need to adjust your ask amount, or learn that your proposal is more likely to be accepted if you customize it to your donor’s interests. Don’t forget the follow through. I am particularly guilty of decelerating on my putting stroke and not having a clean follow through, causing me to miss putts that I should otherwise be able to make most of the time. Too often, we neglect to follow through on the simple gifts, resulting in donors feeling neglected and missed opportunities that should have otherwise been a sure thing. Follow through throughout the gift closing process, as well as ongoing stewardship, is just as critical as making the initial ask. Building a comprehensive fundraising program that utilizes all the tools and strategies you have available means a more sustainable gift stream and less time worrying about making goals and more time to squeeze in a quick nine holes. 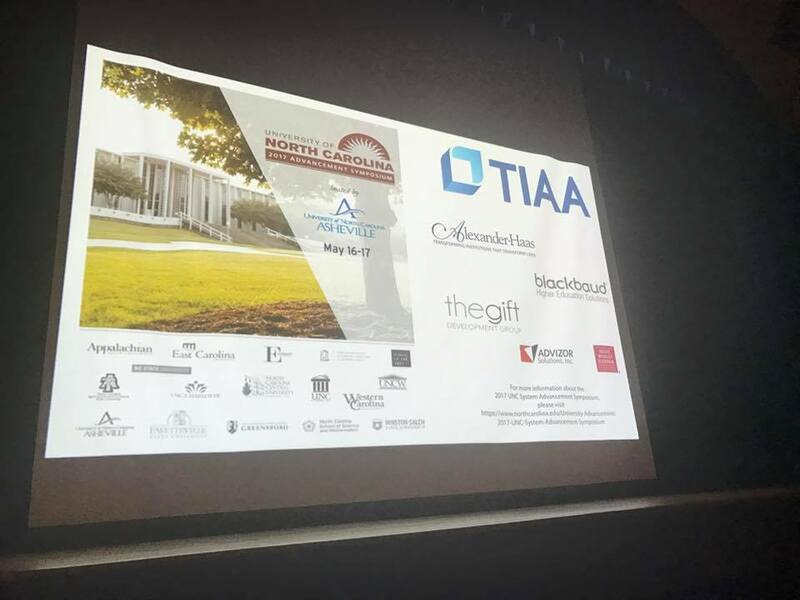 Last week, we traveled to Asheville, N.C. to the UNC Advancement Symposium, a collective of fundraisers, communicators and advancement professionals from North Carolina and beyond. We returned to the office after several days and nights of intel infusion, hanging with the like-minded. During those days, it's an amazing haze of reaffirmation, high-fiving with our tribe, and just getting time in with those doing the good work of fundraising just like us. You check your email, you still get it done, but it feels different because you're developing your skills for a few days, so you listen, learn, engage and wonder about the what ifs for a few days. You're with your people in a dream ahead state. Really, borderline fundraising euphoria. Cut to the first day back at the desk. You realize the truth. You have six weeks to meet our goals. You need to focus on high priority activities. A brick just hit you hard. The conference notepad goes on a shelf or in a cabinet somewhere and you get back to work. This is not an ordinary day anymore. Think on the strategies and energies that you learned that can be applied right now! Yes, You learn some things. Use them today! Data use, strategic annual fund email and mailing segmentation, millennial giving, endowment building, and planned gift strategies can be applied in real time at the end of a fiscal year to meet that mark and above. The others you'll pick up after you meet the goal. Reach out to pals, friends and mentors you made and do this better. That's called a trajectory. Let's do this, together, tribe and all. Sometimes things get tough in fundraising when you least expect it. This has happened throughout my career, when there is a dip in your valley when you at your highest peak. One might say that is because you are on the cusp of making something even bigger happen, and that is when chaos often ensues. Often times, new ideas come with fear of unknown outcomes, and when you are a creative thinker it sometimes comes with a tornado that ends with a rainbow. In fundraising, we set the bar high if we believe in a cause that we feel deserves the enormity of support we’ve imagined it could garner. When a prospective supporter is engaged, it is important to give them the opportunity to find ways to help. Some are more interested in helping through giving advice at a meeting or two, or through joining a group of thinkers like them. We used to push people who weren’t ready to make the leap into a Board seat into something called, “committees” and we now call them advisory groups. Some are more interested in working on a way to invest in the organization immediately, or may need consistent followup. Reading these cues are important, and learning which direction to go in is key to nurturing relationships. This isn’t a job for the impatient. People give to people and what they believe in. It takes time to build the trust to encourage the sacrifice and investment of time, energy, and funds that make things happen for what we believe in. Recently The Wall Street Journal published an article titled "How to Raise Your Child to Be a Philanthropist." A panel of experts gave feedback on the role of parents in instilling philanthropic values in their children from a young age, citing the particular importance of showing that no matter how little you have, there is always room to give. Parents, however, are not the only ones with the responsibility of teaching philanthropy. In fundraising, we often first turn to the known donors, the ones with easy-to-research giving histories and patterns we can analyze and prepare for. But what happens when these donors have been already asked, or more likely, already asked 17 times for different projects in your organization? That is when fundraisers have the opportunity to teach philanthropy, to find the people in their audience who have never thought about giving and emphasize the importance of giving back. In higher education development, we often see this with students and young alumni - often overlooked in initial rounds of fundraising because they don't have giving histories that make them ideal targets - but full of potential to build a culture of philanthropy. By spending time with these donors, targeting your messaging in a way that is less about the size of the gift and more about the impact of participation, development officers can play a significant role in building the next generation of major donors. While no one can replace the impact of a parent's role in philanthropy, it is also important to remember that one's education does not end the moment they turn 18 and leave the house. Everyone who interacts with a potential donor, no matter their age, has the opportunity to be a teacher. Last minute valentine's day shopping often means trying to revive the last bouquet of poor crumpled flowers, and hunting for a box of candy that doesn't have gross flavors. As well-intentioned as such gifts may be, their recipients can often sense the lack of forethought. Similarly, donors can often tell when they've been sent an appeal as an afterthought, when we really want them to feel like the star of the show. Planning appeals ahead of time can ensure that you're getting a quality message to donors. You wouldn't draft a love note to your sweetheart and address it "Dear Significant Other," so why would you address a letter "Dear Donor"? Particularly when creating mailings to ask for a significant gift, make sure you're calling donors by name. If your donor management software has a preferred name/nickname option, use that. Whenever possible given the size of your staff and donor base, use a handwritten note to capture a donor's heart. 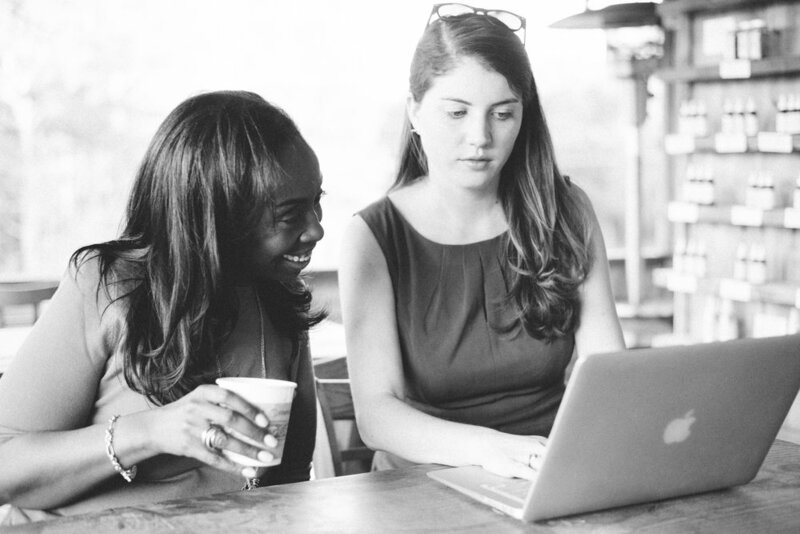 If you're short on resources, add a quick personal note to the bottom of pre-printed letters to your key donors, and recruit other staffers or board members to add personal touches to letters to their connections. While we may pull out all the stops on Valentine's Day, it shouldn't be the only day we show our love. Many organizations are great about sending lovely and personal donor thank yous after an annual gift is made, but neglect to continue the love the rest of the year. Whether it's setting calendar reminders to check in on donors, sending birthday cards or scheduling trips to meet with non-local donors, make a plan to continue the donor connection year-round. The end of year push is finally over and the new year has begun. Many of us walked back into our offices earlier this month hoping that we were on target with our goals. The brand new year in fundraising has kicked off. It’s time to thank those that sacrificed for our causes, and connect with those who may be considering our cause for a gift. Last week, I had the honor of meeting with a donor who was engaging with one of our partners in setting up one of it’s largest endowments. During the dialogue, I asked the donor what more our partner could do to nurture the relationship between them. Her simple answer was communication. Often times, we forget that a simple phone call or note in the mail could be the fresh start we need in reconnecting a relationship, or continuing to move a cultivation forward. Admittedly, as fundraisers we manage many relationships and there are very few ways to do this without being thoughtful about how we communicate. Often there is a simple reason why donors fall away, and it’s contact. Restart your year by reaching out to donors personally, and making it meaningful for them, and for you. Remember that people, ultimately, give to people. Everyone can give. Even in the smallest of ways or the simplest of moments, we all have something we can share with others. I give as a small way that I can support the organizations and institutions that have made an impact in my life. My alma maters gave me more than a degree, they shaped my worldview, enabling me to grow into the person that I am today. I want future students to have those same experiences, to have opportunities for internships, mentoring, all the out-of-the-classroom experiences that donor support can provide. I give to invest in the future. There are so many organizations tackling the most critical issues facing our world today. If I want to see a world with more educated women leaders, strong journalists, healthcare for those in need, a better North Carolina, I can make an investment by giving.